Deflation due to loss of bone and subcutaneous local (eg: face) fat volume. Skin quality deterioration due to aging, ultraviolet light exposure, and smoking. Skin loses it’s resiliency; texture deteriorates; blemishes develop (sun spots, unwanted blood vessels and hair). Muscles (of facial expression) action causing wrinkles by overactivity/repetitive wrinkling with facial mimicry, and chronic tension. Each one of the 3 factors responsible for formation of (facial) wrinkles can be addressed separately, and each of the treatments will complement the other. Dermal fillers restore volume lost due to aging or weight loss, which may help with deflation and skin sagging. 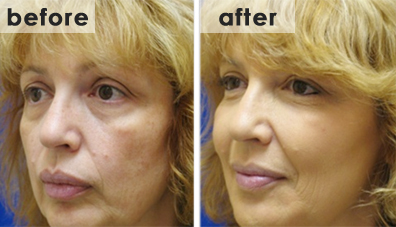 The results of dermal fillers vary from person to person. Besides producing a lift, dermal fillers also have a nourishing effect on skin, thus improving overall skin resiliency, tone, and texture. Various laser & light treatments can help with deterioration of skin quality such as BBL- photofacials for sun spots, vessels, and texture; Laser resurfacing and chemical peels for texture, scarring & wrinkles; and a number of treatment options for laser hair removal. Finally, there are a number of skin tightening laser and radio-frequency treatments that can help with skin laxity. Overactive and overly tense muscles of facial expression can be relaxed with the use of Botox, creating a smooth forehead without frown lines, eliminating crows feet, and other wrinkles in dynamic areas. The results of combining the above treatments can be spectacular, making you look decades younger than your biological age. Please note that results vary from person to person.